Immediately below this is the Weekly “NFL Cheatsheet” – things I referenced in my podcast above, and all the data for ALL the teams. Available only to Season Clients or Weekly Clients. Get on board HERE. … Will humiliated teams rebound? Teams like the Giants, Vikings, Falcons and Steelers were completely humiliated last weekend. Will they get back up this week? Three are dogs (NYG @ DAL, MIN @ BUF, ATL @ BAL) and one is laying points to HOU on Monday Night. The Seahawks dropped in a big way last week. Their home loss to the Cowboys made them 17% less likely to make the playoffs and 25% less likely to win their division. They are still 77% likely to make the playoffs, but are down to just 53% likely to win the NFC West. Now, without Percy Harvin, they MUST beat the Rams on the road, because a loss drops them to just 42% likely to win their division. The Texans are 20% less likely to win the AFC South after dropping a home game against division rival Indianapolis last Thursday. To make it up, they would have to win in Indy later this year, which is a tall order. They almost came back to win that game vs the Colts (which would have been an NFL record) but fell just short. If they drop this game to the Steelers, they are just 12% likely to make the postseason. Despite being road underdogs, they really need a win on Monday. … What the read-option embracing, suddenly efficient offense of the Carolina Panthers can do in Lambeau vs a Dom Capers led Packers defense which has struggled historically vs running QBs. In the first 5 games of the season, Cam Newton ran a total of 2 times on read-option plays. With a healthy ankle, last week he ran on read-option plays TEN TIMES! He’s also passing the football better than he’s ever passed it down in Carolina. It should set up for a memorable game vs the Packers today. … The Giants to fail to make halftime adjustments. Last week, they looked terrible heading into the locker room vs the Eagles. Yet this team made the Eagles defense look like they were being coached by Buddy Ryan decades ago. Tom Coughlin and Bob McAdoo looked as if they brought the same, terrible approach to the 2nd half that they did in the first half. It’s one thing to lay down with a few minutes to go in a game. But to play dead after 1 offensive drive in the second half is an embarrassment. I can’t wait to see how this team comes out of the gates this week vs the Cowboys. Because according to NFLproject.com, if the Cowboys win this game, they are 68% likely to win the NFC East. And a loss drops the Giants to 3-4, and while that does not sound bad, because they are in the NFC East (with PHI and DAL) and the NFC (with a ton of good wild card teams) the Giants will be ONLY 5% likely to make the playoffs. Don’t tell Tom Coughlin! FIVE PERCENT! … Dome teams fail to show up on the road. Its so elementary, but it really is amazing how big a disadvantage it apparently is for dome teams to perform on the road. This week, we have several trying to get it done: ATL @ BAL, NO @ DET, ARI @ OAK. Last year I could toss in MIN @ BUF as well. … Last week I said Matt Stafford struggle without Calvin Johnson, and Stafford did indeed struggle, completing just 58% of his passes (worse than Teddy Bridgewater) for only 4.7 yds/attempt. While that element is still in play, I’ll toss in his counterpart for the QB who Stafford faces, and that’s Drew Brees struggle without Jimmy Graham (should he not play). Ignoring 2012 (without Sean Payton) the Saints are 35-15 when Graham catches a pass, including 14-13 on the road. When Graham is injured and not playing, the Saints are 4-4, including 1-3 on the road, and are 0-4 ATS in those games. If the Saints lose to the Lions, they drop to just 25% likely to make the playoffs (right now they are 35% likely to make them). If the Saints win, they are right back in the mix, at approximately 45% chance. Because both of these teams (DET & NO) likely could be competing for just 1 Wild Card spot, this game is the BIGGEST game of the weekend for playoff implication! … On Saturday afternoon, there were 28 teams left to play 14 games between Sunday and Monday night. Yet NOT ONE SINGLE TEAM was a home favorite of 7 or more points over at the Super Book (formerly LVH). I had to look through my database to confirm: there has NEVER been a NFL Sunday/Monday slate without at least 1 home favorite of 7+ points in over 25 PLUS YEARS (as far back as I looked)! Since, Denver has been adjusted to -7, but this appears to be a very strange and unique week for the NFL. … The Lions became the FIRST team since 2009 to convert just 1 third down in a game despite having 12 or more 3rd down attempts and actually WIN the game without a non-offensive return TD. Prior teams in the last 5 years were 0-27, losing by 17 ppg. The Lions won 17-3. BUF will improve its playoff odds to 27% with a win, but drop to 11% with a loss. PIT will make it to the postseason 23% of the time if they win, but a loss drops them to only 9%. CHI will only improve to 19% with a win but a loss snuffs them out down at 8%. 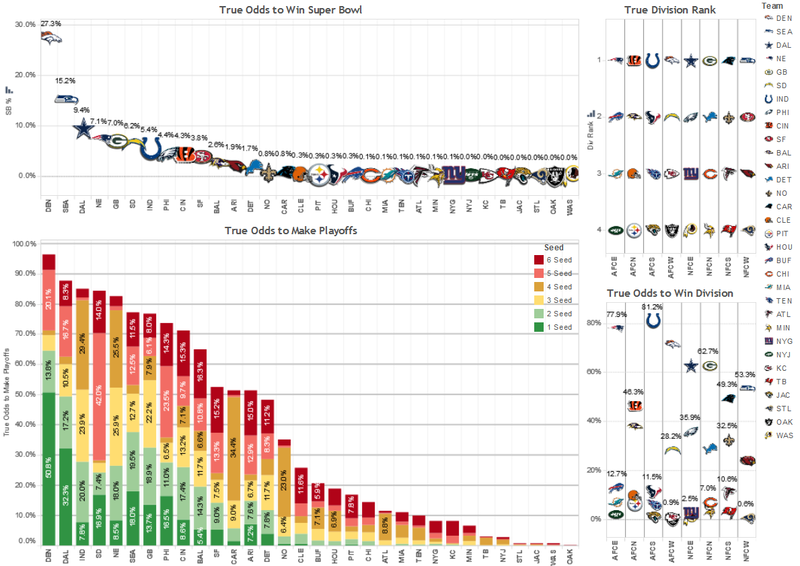 NYG will only see the playoffs 16% of the time if they beat DAL, but drop to 5% with a loss. Ordinarily you might think that a 4-3 team stands a pretty good shot at the postseason, but these 5 teams play in divisions where they will be fighting for a wild card spot against other superior teams. Hate to put a damper on the parade when any of these teams move to 1 game above .500, but they need to still do a lot of work because even if they win, they’re on the outside looking in. For all team simulations of upcoming win & loss simulations, click the below week 7 graphic and scroll down to the bottom. .. The largest EDSR (Early Down Success Rate) advantage this week will probably surprise you: its the Washington Redskins over the Tennessee Titans. The Redskins rank top 5 in pure offense and defense (4th in offense and 12th in defense when adjusting for strength of schedule). Meanwhile, the Titans rank 19th in pure offense and 32nd in pure defense (20th and 29th when factoring in schedule). … The largest “30-&-In” advantage is the Cowboys over the Giants. Dallas ranks #4 offensively and (surprisingly) #1 defensively. I do NOT view this team as strongly defensively as they appear, but because their offense controls the clock AND puts up points, opposing offenses get faced with the procrastinator’s dilemma: I only have THIS much time [squeezes index finger and thumb until they almost touch], and I have to do THIS much work [extends arms in opposite directions as far apart as possible, as if trying to hug the Ticket Oak]. It puts a huge tax on their mental and physical execution, and even teams like Seattle struggle to gain rhythm possessing the ball for just 22 of 60 minutes. … Crucial divisional battles? Only a couple this week: NYG @ DAL and SEA @ STL (which is only important for Seattle). … A battle of the worst teams this weekend? The Nation’s Capital gets to host this gem: TEN @ WAS. Yikes! … A solid primetime slate of games? Only on Sunday night. I personally cannot wait to see the gameplan the 49ers choose to use when attacking the Broncos. Execution is as important as choosing the right game plan, but executing the wrong game plan won’t get the job done. I hope Jim Harbaugh studied up on Mike McCoy’s and Andy Reid’s film. The Chargers and Chiefs were the only 2 teams since early 2012 to finish within 7 points of the Broncos in Denver (without needing 14+ points in the 4th quarter). The Chargers did it twice (a 7 point win and a 7 point loss) and the Chiefs did it once (a 7 point loss). Everyone else failed. … Check out my logic for the free recommendation of week 7. GOOD LUCK on this 7th Sunday of the NFL Season!